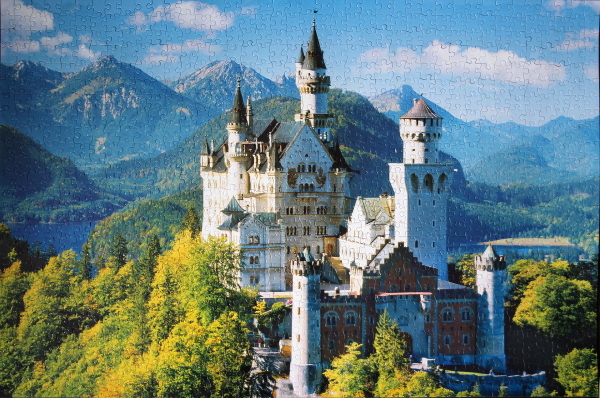 Notes: I have put together another puzzle of the Neuschwanstein Castle before, 500 pieces. The inspiration for the construction of Neuschwanstein came from two journeys [of Ludwig II] in 1867: one in May to the reconstructed Wartburg near Eisenach, another in July to the Chateau de Pierrefonds, which Eugene Viollet-le-Duc was transforming from a ruined castle into a historistic palace. The king saw both buildings as representatives of a romantic interpretation of the Middle Ages as well as the musical mythology of his friend Richard Wagner. Wagner’s operas Tannhauser and Lohengrin had made a lasting impression on him.